On these covers they are pretty much the same. 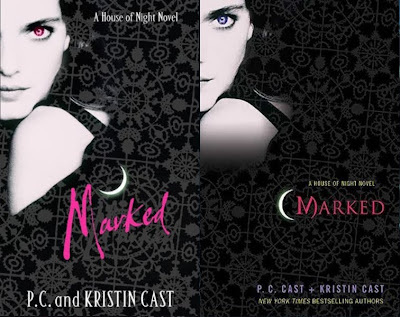 One things I luuuuurv about the house of night covers are the clear glossy amazing intricate patterns. For Marked they are the same but I have to say I prefer the UK cover myself. Seeing as the covers are the same it is tiny details which make the UK cover better. For starters I like the UK font much more. It fits the gothic theme more and it looks like it was marked on with ink. One think I love about both covers is the way it's all black and gothic with a SPLASH of colour. The UK author font works for me along with the better positioning of the moon. The best bit of the UK cover thought is how the UK girls eye has been manipulated pink. It really adds colour and a smidge charecter and the PICK ME UP effect. Also on the UK cover it shows more of the girl and the picture carries on, on the spine. The only thing that lets the UK cover down is that I like the placing of the A HOUSE OF NIGHT NOVEL better on the US.